15 Comments This post may contain affiliate links. 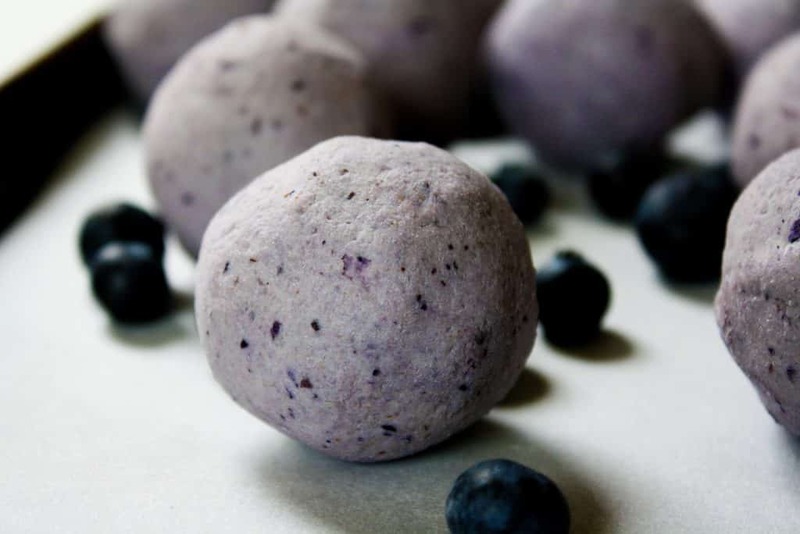 These Blueberry Bliss Fat Bombs are full of delicious berry flavor and are a power-packed source of nutrient-dense ingredients! When the seasons change, I always have one thing on my mind: FRESH PRODUCE. Purchasing produce while it’s in-season, aside from the obvious price reduction, is usually much fresher and higher in nutrients as it likely didn’t have to travel as far to show up at your local grocery store. Plus, it just tastes better! Now that summer has arrived, berries are finaaaaally in-season (and no longer cost $300 + your first born child per 1/2 pint)! After fully stocking up on enough blueberries to feed our entire neighborhood, I figured that I needed to put them to good use and develop some fun, new summer recipes. Well, since I’m on a fat bomb kick, the answer was simple: Blueberry Bliss Fat Bombs! The final result is SO GOOD. The texture is perfect and is similar to that of my Lemon Bar Fat Bombs. These fat bombs taste amazing, plus their nutritional value is spot on! Blueberries are considered to be one of the most nutrient-dense foods available to us. They are loaded with vitamin K, vitamin C, manganese, and fiber, all of which are critical components in a healthy, balanced diet. The antioxidant power of blueberries make them incredibly important in reducing inflammation, boosting brain power, promoting heart health, and supporting digestion. With less than 5g net carbs per serving, this recipe serves as a delicious dessert for all of my fellow low-carbers and ketogenic dieters. I especially love the addition of blueberries in these as fruit is typically much too high in carbohydrates for a low-carb lifestyle. For me, personally, eliminating high-carb fruits but maintaining a diet that includes berries has provided me with really positive results. With the inclusion of berries in this recipe, these fat bombs give me a great boost of energy and satisfy my craving for sweets! Win, win! 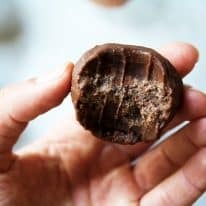 These fat bombs are perfect for those who follow a paleo lifestyle. Plus, Ryan made an interesting comment that these fat bombs taste very similar to a Blueberry Muffin Larabar. Larabars are enjoyed by many during or after their Whole30 diets. However, Blueberry Muffin Larabars are non-compliant due to the vanilla extract. 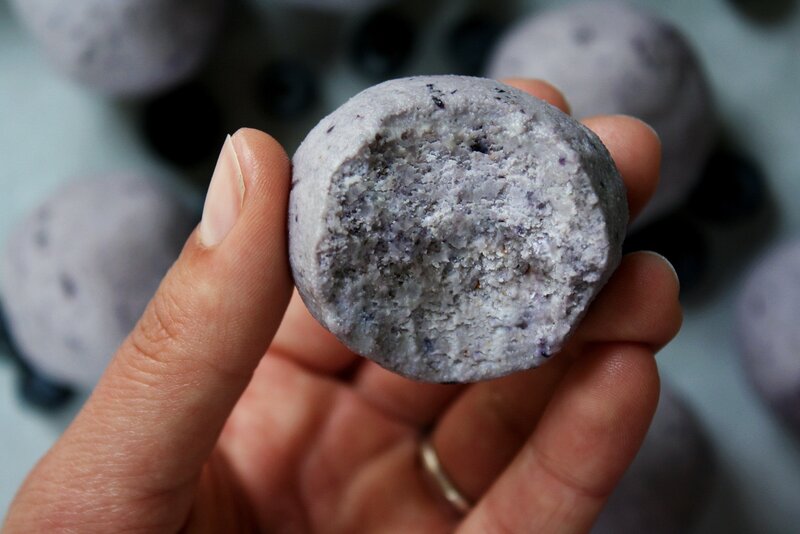 So, these Blueberry Bliss Fat Bombs would be a great option if you find yourself craving some in-season blueberries! You can find a nutrition label including macros of this recipe near the ingredients and directions of the recipe below. This recipe is keto, low-carb, paleo, gluten-free, grain-free, dairy-free, vegetarian, vegan, and refined-sugar-free. 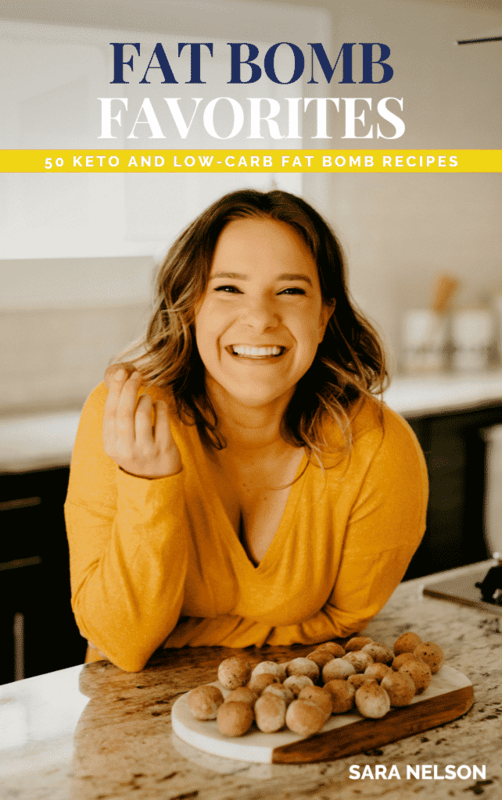 Take a look inside and place your order for “Fat Bomb Favorites,” a digital cookbook including 50 keto-friendly and low-carb fat bomb recipes! These Blueberry Bliss Fat Bombs are a delicious dairy-free keto dessert option to satisfy your sweet cravings! This recipe is keto, low-carb, paleo, gluten-free, grain-free, dairy-free, vegetarian, vegan, and refined-sugar-free! In a microwave-safe bowl, heat frozen blueberries for about 1 minute, until just slightly warmed. If using fresh blueberries, heat in microwave for about 20 seconds, until just slightly warmed. Combine all ingredients in food processor and blend until well-combined. Transfer mixture to medium bowl and place in freezer for 30 minutes. Can you just uses cashew butter for your recipes that required “raw cashews/soaked/blended/etc?” my local store has fresh ground cashew butter and I think this would save time. Great question! I think that would work, but can’t say with complete certainty as I haven’t personally tested it. If you do try it, let me know how it goes! ? Enjoy! I’ve made these fat bombs with both fresh and frozen blueberries, as sometimes frozen are cheaper when blueberries are out of season, and the difference in taste is negligible, and it certainly doesn’t warrant a 1-star review. I’ll buy fresh when I can, but I’m also more than happy to save a buck when I can. Bottom line, fresh or frozen, these are still a super creamy, delicious dessert or snack. Thank you! And agreed! 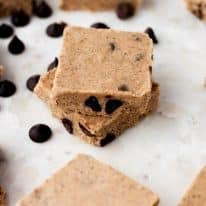 🙂 These fat bombs are absolutely delicious! What stevia did you use? The link no longer works. Thank you! Hi, Ali! The company, Wholesale Health Connection, is going through a re-brand right now, so they took their products off of Amazon during the transition. I would recommend just using whatever brand you can find at the store. 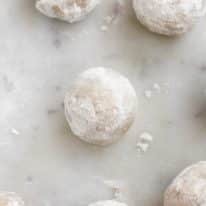 When making the recipe, start with only a little of the stevia and then taste-test the mixture before chilling it to add more based on your preferences. Can you substitute cocoa butter instead of coconut butter? hi, Katherine!! Thanks for your question! Unfortunately, since cocoa butter and coconut butter are pretty different in terms of flavor, I’m not sure if that substitution would work. If you eat dairy, cream cheese in place of coconut butter may work, but, since I haven’t personally tried this, I can’t say for sure! hope this helps!! Do I have to use the nuts in this recipe? 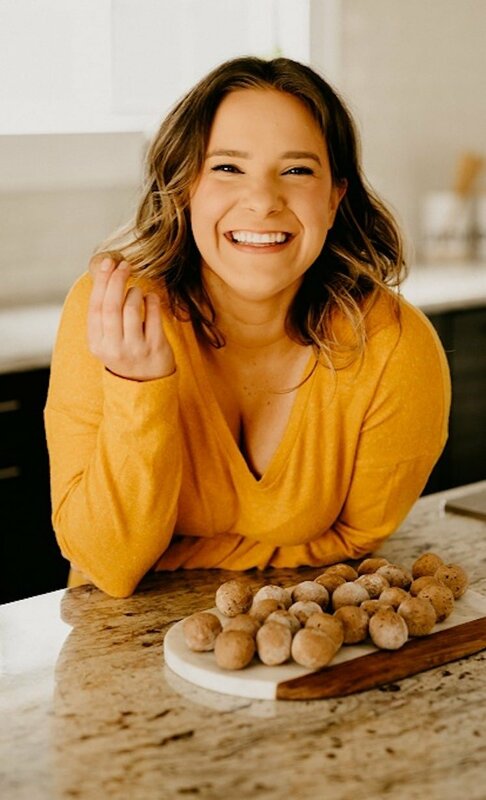 I make fat bombs, but have never added nuts….just wondering. I don’t have any first off and generally use almonds or walnuts when I eat nuts. Thanks! They do sound amazing. hi, Mary!! Thanks so much for your question! The cashews are necessary in this recipe as they serve as the binding/structural material of the fat bombs. I have several other fat bomb recipes on my site that should work for you if you don’t want to use cashews 🙂 You can find them in the menu under "Recipes" and then within the drop down menu that says "Fat Bombs." hope that helps!! Thank you Sara! I will check your other recipes…appreciate your reply. How long they are safe to keep in the fridge?